Adventurers enter dungeons every day. Battling monsters, defying danger, smashing devious traps, ignoring the logistics of it all. Arrow traps, who reloads it? Pitt falls, who cleans out the bodies and sharpens the spikes? What if the grates get clogged, where will the blood and gore drain? For those who study ancient lore or planning war, they don't want to worry about all that. They just want peace. 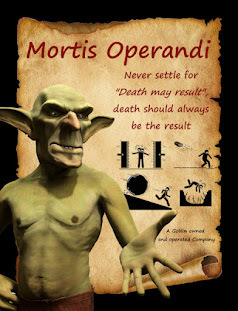 Mortis Operandi is a company that facilitates security and peace for discerning individuals. The next painful day, Elric was awakened by a foot digging into his side. Elric to rolled over and away from the intrusion and a shattering of glass pierced the veil of sleep. Elric was lifted into the air and the sudden loss of a surface below him pulled him awake. Bright lights were moving towards his face. A croaking like sound escape from Elric’s throat as he attempted to yell. “While HR is available to our employees when they need it,” Sandra said. “Passing out is generally not the use we encourage.” She waved a hand and Elric’s floating form moved towards the door. A small kindness, she lowered Elric before he hit the door frame, and his floating form floated out of the room. “Come back when you have cleaned up,” then she closed the door. A large illusionary image filled the dragons cave. Giving a top down perspective in the image a couple of humans wandered the halls of a temple. Each carried a backpack almost as big as them on their backs. Clanking with each step from weapons and armor, and metal objects in the backpacks. The hallway ended in a large round room. In the center of the room a stone pedestal with a book setting on it. The two humans carefully entered the room and walked around the walls. Each examining the wall for cracks, buttons, and holes. Upon finding no traps along the walls they carefully walked to the middle of the room. Another long minute passed as they examined the book and two foot tall pedestal. One of them picked up the book. The second and third day of setting up additional OR-5651’s went better. Elric prepared sleep spells for the goats and was able to avoid getting blood on his clothing. The energy to set up each room was intensive so he could only do one room per day. At the end of the final day in Hausten, Elric went to a tavern to celebrate. After changing his clothes into something more casual, Elric stepped out of the inn. The sun had already set and the streets were almost empty. A pair of guards wandered around lighting lamps along the street. Faintly in the distance, Elric heard music playing. With a swift pace, he headed towards the music. Elric stretched and stood up. The runes he had carved on the floor looked correct. Moving over to a different side, he studied them again. He could not find any flaw, now it was a matter of testing. Slowly and stiffly he walked over to one of the goats. He untied it from the other and pulled it towards the runes. The goat struggled against Elric’s directions and thankfully the center of the room wasn’t very far. Elric pulled a wooden rod out of a pouch, held it in the air, pressed an almost invisible button on it. As he let go, the rod stayed in place. Quickly he looped the goats leash around it and tied a secure knot. Elric easily walked from the inn he was staying at to Victor Von Vissionstein’s mansion. The customer maintained a beautiful house in the city of Hausten. The gates opened for Elric as he approached and he was immediately greeted by four guards. They all wore full armor and helmets covering every inch of their body. One of them stepped up towards Elric and raised their faceplate. The man had a huge boil on the tip of his nose that Elric think of clown. “This is private property, if you do not have business here, please leave.” The Clown guard said. “I do have business, if you allow me to get the letter.” Elric said. Slowly he moved his right hand towards one of his pockets. He watched the guards to make sure none of them made a movement. The standoff continued as Elric reached his hand into the pocket, slowly pulled out the rolled up scroll, then slowly presented it to Clown guard. “Eft, now that you know the secret, I believe you have something to tell Elric.” Ventus said to Elric and Eft as they sat around a table. The two goblins sat in tall chairs so they were able to look at Elric eye to eye. Ventus was in his goblin form to prevent any accidents. The two goblins sat in tall chairs so they were able to look at Elric eye to eye. While the dragon was still angry, he at least recognized it was no fault of his workers in front of him. “Um, that is a lot to take in.” Eft said fidgeting with his hands a little. The old goblin shook a little in fear. “Eft,” Ventus said, his voice rising a little. Even in the goblin form, a little cloud of smoke puffed out of his mouth. “I’m sorry that I lied to you Elric.” Eft said looking down and away from Elric and Ventus. “It is ok, I forgive you.” Elric said quickly without thinking. After the fire protection potion had saved Elric’s life, he felt a small debt towards Eft. In an effort to expand the locations people can read this project I'm working on. I'm also posting it to Royal Road. Elric opened his eyes and lowered his hands. The goblin form of Ventus stood in front of him, wide eyed and mouth slightly open. The demon Francis came running quickly from the other side of the room carrying a bandoleer holding several potions. The smell of burnt clothing and hair filled Elric’s nose. He shook a little as his body tried to decide what it was going to do, it settled on screaming. “Aaaahhh! !” Elric said, screaming as he fell to his knees. The cool stone floor touched his skin where his pants had burned away. “I’m so sorry, I didn’t mean.” Ventus said rushing towards Elric. A slight haze from the fire still surrounded Elric. Elric appeared in the teleportation room at Mortis Operandi. He turned and thanked Guldag. When he turned towards the door, he saw a goblin bolt down the hallway. Not thinking anything of it, Elric headed to his room. While Elric didn’t lock his door, it being slightly ajar worried him. Gathering up some power just in case, he opened the door. Sitting on his bed inside was Eft. “Alright when do we go?” Elric said. As Eft told his tale, Elric nodded his head and tried to note anything important. Marcanous’s group seem to not take precautions when using unknown powerful magic. They also appear to be unquestioningly loyal to each other to the point of being blind. A long moment passed after Eft went silent before either of them spoke. “I’m sorry.” Elric said, breaking the silence. “Thank you, it gets easier over the years,” Eft said. His tale over, he reached and finished the remaining amount in the bottle. Over the next few minutes Elric explained how he tested the rumor. The next step was to explain what he intended to do. He included everything so Eft could fully understand the end goal. “Ten, no fifteen years ago, gods has it been so long. It is much easier now, that I don’t about them each day. Margaret, Samuel, and little Denise. Denise would probably be a mother in her own right. She always loved acting like her dolls were her babies. She, she,” Eft turned his head away from Elric and his little goblin body shook several times. Elric didn’t make a move. He was still mulling over the idea that Eft was once human. Why hasn’t the goblin gotten the spell reversed? Slowly and without making a sound, Elric reached over and slowly uncorked the bottle of liqueur. Carefully he put a handkerchief on the desk near it, then waited. “I’m sorry, it is not something I’ve thought about, but the pain is still real.” Eft said as he turned around wiping his wet eyes. He saw the bottle and the handkerchief on the desk. He grabbed the cloth and wiped his eyes. The next day went by quickly for Elric. Norman arrived right after sunrise and they met in front of the tavern. Elric had arrived much earlier in the hopes of meeting Alda. The mostly empty tavern room and lack of a cook, yielded a breakfast of disappointment. Elric arrived back at the town while it was still light out. As he dismounted from the horse he turned and looked at Norman. “I hope we meet again,” Elric said. Elric laughed and waved at Norman. Turning around towards the gate, he did not watch the henchman and his not breathing horse ride back into the woods. The guards at the gate didn’t stop him again, nor did they seem to acknowledge his presence.